For those that have not been to Changi Airport for a while. You will be surprised that you can find a wide variety of food available at the 3 terminals. There is a food court at the basement of the newly built Terminal 3. As I was craving for something warm and soupy, I ordered Qiu Lian ban mian. 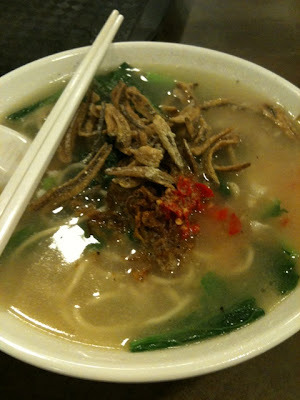 I liked the thick and rich soup of the ban mian. Qiu Lian Ban Miah at Changi Airport Terminal 3 service is bad. I went to Terminal 3 @ around 12pm i order the Hot and Spicy Noodle end up he cook normal ban miah. I repect my order for 3-4 time and end up he still can cook the wrong order. And when i see my wrong order i told him again uncle i order hot and spicy not the normal ban miah he still can said i never said hot and spicy. What kind of service they have? Such a bad service i ever see. And he change the soup base i think he put alot of chilli oil. I was thinking am i eat hot and spicy or chilli oil? With this experience i won't buy anything from this stall again. Such a bad service and also rude to customer.